GeoMax is an international active company developing, manufacturing and distributing quality surveying instruments. GeoMax provides a comprehensive portfolio of integrated instruments for the surveying, mapping and construction industries. Both occasional and professional users are addressed with GeoMax's easy to use, yet highly productive range of Total Stations, GPS, Lasers, Optical and Digital Levels. 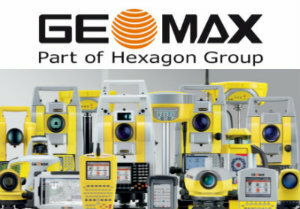 GeoMax is part of the Hexagon Group, Sweden, a world leader in multidimensional measurements within the macro and micro segments of the measurement and positioning market. The close cooperation within the Hexagon Group grants GeoMax access to state of the art development and production facilities in Europe, America and Asia. This enables GeoMax to focus on delivering products that "work when you do" by optimising quality and productivity. GeoMax products are available in Europe, Asia and the Middle East.